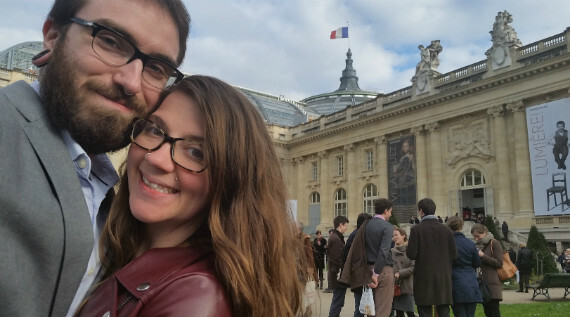 I hate to brag, but the last few weeks have been quite lovely, with getting married to my partner in life, Valerie Rettberg-Smith, and our subsequent honeymoon to Paris and Amsterdam and all. That said, I have returned, not quite rested, but full of hope, love, fresh perspectives and just now getting back into the swing of things. While I was away, Rachel Donadio of The New York Times wrote a piece on the Grand Palais’s Lumière! Inventing Cinema exhibition which opened March 27th, just in time for me to investigate. The exhibit, put together in partnership by the Grand Palais and the Institut Lumière, features an incredible history of film technology and the impact the Lumières continue to wield in artifacts and copious amounts of newly restored Lumière productions, some on film and others in various interactive displays. Celebrating over a hundred years since the Lumière brothers brought cinema as we know it into being, the exhibition runs now through June 14th. Most of the Lumière films were in fact brief documentaries, running no more than a few minutes at most. The format continues to be more than relevant, as the stark cell-phone documentation of Walter Scott’s horrifically unjust murder by officer Michael T. Slager proves this past week. Writing for Time, Errol Morris commented on the necessity of documentation in terms of sorting out the truths in such a situation, while Ty Burr of The Boston Globe wrote at length on what he calls, “the cinema of evidence” and its essential pivot point in the battle against abuses of power in America. One would think such blatant injustices would have been curbed after this past year’s outrage in the wake of Michael Brown and Eric Garner’s murders by overzealous police, but alas, the preposterous bloodshed continues. On a lighter note, tomorrow marks the start of the Spring ’15 season of Stranger Than Fiction with KING GEORGES, Erika Frankel’s documentary on the fiery French chef Georges Perrier and his crusade to keep his 40-year-old landmark restaurant, Le Bec-Fin in Philadelphia, relevant. Both director Erika Frankel and film subject Georges Perrier will be on hand for a post screening Q&A. Info on the film and tickets are available here. This past weekend a few different notable film festivals kicked off, including the Full Frame Documentary Film Festival in Durham, NC, and Art of the Real at the Film Society of Lincoln Center in New York City. At his What (not) To Doc blog, Basil Tsiokos previewed the Full Frame lineup, as did Tom Roston for POV’s Doc Soup. For Variety, Addie Morfoot reported from the fest on films such as our previously mentioned KING GEORGES, as well as FROM THIS DAY FORWARD, amongst others. Yesterday, the Full Frame jury awarded Lyric R. Cabral and David Felix Sutcliffe’s (T)ERROR and Betzabé Garcia’s KINGS OF NOWHERE the The Reva and David Logan Grand Jury Award for best film. On Art of the Real, Richard Brody wrote a lovely piece on the fest and its focus on female filmmakers for The New Yorker, while Daniel Walber listed his five must see docs at the fest for Nonfics. At the Film Society of Lincoln Center‘s own site, Elisabeth Subrin, a filmmaker whose work received a program screening this past Saturday as part of Art of the Real, can be found in conversation on various aspects of her work. Basil Tsiokos also wrote up an overview of the fest this week, as well as a pair of other doc-centric fests in Brazil’s It’s All Real International Documentary Festival and Florida’s Sarasota Film Festival. Next month, the Film Society of Lincoln Film Center is also sponsoring a memorial and celebration of late filmmaker Bruce Sinofsky at the Walter Read Theater in New York City on May 5th. The event begins at 2 pm with a reception to follow. Anyone interested in attending should RSVP to BruceSinofskyMemorial@radicalmedia.com. Nearly a month after its premiere on HBO, Alex Gibney’s GOING CLEAR is still making quite a stir. This past week, Matthew Jacobs of The Huffington Post reported that the film, with 1.7 million viewers, was the most watched documentary to run on HBO in nine years. According to Adweek’s Christopher Heine, the Church of Scientology has purchased mass amounts of promoted Tweets in response to the film, while The Guardian’s Benjamin Lee reports that John Travolta, a long time Scientology believer refuses to watch the film. Taking a broad look at Gibney’s recent output, Variety’s Peter Bart outlines Gibney’s searing interest in celebrity culture. In theatrical releases this week, Frédéric Tcheng’s DIOR AND I reigns supreme, having received reviews from A.O. Scott in the New York Times and Genevieve Koski at The Dissolve, as well as interviewed by Indiewire’s Nigel M. Smith and Brian Brooks of the Film Society of Lincoln Center. Mike Attie and Meghan O’Hara’s IN COUNTRY also received a pair of reviews from The Dissolve’s Jen Chaney and AV Club’s Adam Nayman, while Michael Obert’s SONG OF THE FOREST was reviewed by J.R. Kinnard of Sound on Sight and John Pirozzi’s DON’T THNK I’VE FORGOTTEN: CAMBODIA’S LOST ROCK AND ROLL received a thorough write-up from Ben Sisario in the New York Times. Last but not least, Adam Woodward published both a review of Brett Morgen’s KURT COBAIN: MONTAGE OF HECK and an interview with the filmmaker over at Little White Lies. Other interviews posted around the net include Margaret Barton-Fumo‘s conversation with Nick Broomfield at Film Comment on TALES OF THE GRIM SLEEPER and Erica Schwiegershausen’s interview with INDIA’S DAUGHTER director Leslee Udwin for New York Magazine’s The Cut. Samuel Fragoso also spoke with Robert Greene about his film ACTRESS and the inevitability of role-play in non-fiction cinema over at Fandor’s Keyframe. In addition to being interviewed, Greene published a semi-autobiographical video essay on the theme of Southern Gothic cinema for BFI, while a video essay on Walerian Borowczyk was published by Violet Lucca on the Film Comment website as well this week. On the topic of video essays, Catherine Grant of Film Studies For Free posted an in-depth video encapsulation of desktop doc-essay master Kevin B. Lee’s recent masterclass at the School of Media, Film and Music, University of Sussex, UK. A new New York Times Op-Doc, THE BULL RIDER by Joris Debeij, was also posted this week, as was a report by Sergio of Indiewire on Cecile Emeke’s STROLLING docu-web series. Starting tomorrow, Brett Gaylor’s National Film Board of Canada backed web series DO NOT TRACK is set to premiere in episodes over the course of the next three months. Following in the shadow of Norman Lear‘s New York Times opinion piece questioning PBS’s recent decisions to pull their POV and INDEPENDENT LENS series from their programming spotlight, POV has opened up their call for entries for the 2016 season. Likewise, Ex Oriente Film is now accepting submissions for their 2015 film workshop. The regular deadline for 2015 submissions to DOC NYC is fast approaching with a cutoff date of April 17th – this coming Friday. I’ll leave you this week with a trio of fun pieces. The first, sees Nonfics’s Christopher Campbell reflect on how to set a documentary in the future, while the other two are celebratory lists – one by Indiewire’s Playlist staff counting down their top 25 music docs of the 21st century so far, the other sees the BFI’s Ros Cranston and Catherine McGahan listing 10 great modern British documentaries directed by women. As always, until next week, if you have any tips or recommendations for the Memo, please contact me via email here, or on Twitter, @Rectangular_Eye. I look forward to hearing from you!